If you're moseying around the Wimbledon grounds then court 18 has a strong first game - big-hitting Coco Vandeweghe of the USA will take on Mona Barthel from 11:30 BST. Lanky teenager Alexander Zverev - one of only two players to beat Roger Federer this year and easily one of the most watchable players about - is third on court three. There might be time to watch big brother Mischa Zverev, who opens up on court 14 against Bernard Tomic. Richard Gasquet and Grigor Dimitrov are first and third on court 12 respectively, with Gael Monfils second on court 18. Man of the moment Alex Ward was all smiles when he arrived at the Aorangi Park practice courts for a final hit before his first-round match. The world number 885 from Northampton, who plays fellow Brit Kyle Edmund on court three at 11:30 BST, told me he was "feeling good" and he certainly looks pretty relaxed at the moment. Alex Ward has had a remarkable trip back to Wimbledon this year. He lost in the final round but was handed a lucky loser spot into qualifying - and he's not looked back since. "I do feel on cloud nine," the 27-year-old told BBC Sport yesterday. "I remember last year, my mum came to watch and that was the first time I'd played in the main draw and she walked through the gates with me and was crying straight away. She was really proud." Excited for today, tennis fans? What's the match that's caught your eye? Any of you feeling brave enough to try a few predictions? Get in touch with us throughout the day using #bbctennis on Twitter. BBC Weather's Simon King: "It has been a glorious start to the day at Wimbledon with lots of blue skies. While the cloud will increase a bit, there’ll be good sunny spells throughout the afternoon and the better news is that it should be a dry day. It’s going to be a warm one too with a maximum temperature of around 25 degrees. "Temperatures will get even higher on Wednesday with a high up to around 27 degrees with lots of sunshine." It is never too early for ice cream. I say this as someone who is eating chocolate for breakfast. Speaking of ice cream, how's the weather looking? All these people have camped in The Queue overnight in the neat rows of tents, so they're well versed in queue etiquette - even when it comes to waiting for the loos or buying an early morning coffee, or ice cream at Wimbledon Park. It's never too early for an ice cream in this weather! They've all packed up their tents and left them at the left luggage marquee ready for a day's tennis action. Can world number one Angelique Kerber kick her season into gear? In the absence of Serena Williams she's first up on Centre Court from 13:00 BST as she takes on Irina Falconi. Eastbourne champion Karolina Pliskova is second on Court One, taking on Evgeniya Rodina, while Agneszka Radwanska faces Jelena Jankovic on court two. 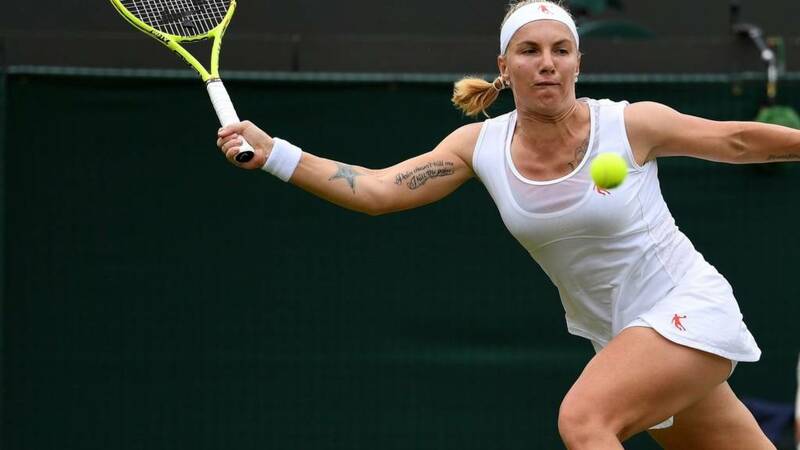 Two-time Grand Slam champion Svetlana Kuznetsova is last on court two for her match against Ons Jabeur, while Garbine Muguruza gets under way second on court three against Ekaterina Alexandrova. Second seed Novak Djokovic begins his Wimbledon campaign on Centre Court. He's on second, where he'll be facing Slovakia's Martin Klizan. He'll be followed by seven-time champion Roger Federer and Alexandr Dolgopolov. Those matches will get going any time after 13:00. On Court One, last year's finalist Milos Raonic plays his first round match against Jan-Lennard Struff from 13:00 BST. Dominic Thiem is third on that court, facing Canada's Vasek Pospisl. Juan Martin Del Potro kicks things off on Court Two from 11:30, playing Thanasi Kokkinakis, while Tomas Berdych is third on court against Jeremy Chardy. Alex Ward sat in the makeshift media tent at Roehampton qualifying last Thursday shaking his head in disbelief. "It's just amazing," he said after making the main draw of Wimbledon. His good friend Marcus Willis captured the headlines last year when he won six matches in pre-qualifying and qualifying ranked 772nd, but Ward has outdone him. The 27-year-old from Northampton actually lost in pre-qualifying but got a lucky loser spot, and made it all the way through ranked 855th. Ward got a wildcard last year, and said: "This feels so much better because I earned it." On to today - and there's five Britons in action across four courts. The battle of the Brits gets under way at 11:30 BST on court three, where Kyle Edmund faces his good mate Alex Ward, the world number 869. Wildcard Katie Boulter makes her first Wimbledon appearance second on court 12 against America's Christina McHale. James Ward is fourth on court 18, playing Macros Baghdatis, while Bryden Klein is third on court 16 playing Japan's Yuichi Sugita. There were wins for Andy Murray, Johanna Konta, Aljaz Bedene and Heather Watson on day one. Petra Kvitova continued her comeback, Victoria Azarenka won on her first Grand Slam match since giving birth and Rafael Nadal eased through on his Wimbledon return. It wasn't Stan Wawrinka's day, though, as he lost on Centre Court amid struggles with a knee injury. Morning! Welcome to day two at Wimbledon. As always, there's plenty going off at SW19, and we'll bring you the best of all of today's action. There are some big names on court, and a fair few British interests too. But first, a recap of what went down on the first day in London. Some things never change at Wimbledon. The queues, the buzz around the ground, the strawberries - even the rain. For others, it's as though they've never been away. Only the haircuts have changed, ey, Roger?